Right from the opening pages I was transported into life at Hiram Hall, the home where Elin has lived all her life, and continues to live now with her husband Hugo and cousin Alice. 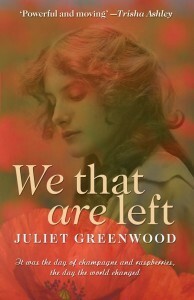 I had been waiting for Juliet Greenwood's next book after really enjoying Eden's Garden and We That Are Left was so worth the wait, it is a moving contribution to WWI fiction and an enlightening exposé on how perceptions and the role of women experienced a complete and irreversible paradigm shift. A war vet from the Boer War, Elin's husband is soon to be called up again as WWI approaches, disrupting life for everyone and changing them in ways from which there will be no turning back. We meet some memorable characters who we know will take us on a hair-raising escapade and each location inspires the imagination - the homes, the countryside and villages were so vivid it was almost like watching a film, and better than an episode of Downton Abbey in my opinion! The book is set in Cornwall, Angelsey Wales and northern France and whether its the drama of war, creativity in the kitchen or dodging bullets in a bombed out village, it is riveting reading, a book I could not put down and more than just reading, it made me want to bake! Which I did! There are authentic and adapted recipes in the back of the book for some of the dishes mentioned, the kind of thing that was being prepared in the early 1900's during war-time. My complete review here at Word by Word. Sign into Goodreads to see if any of your friends have read We That Are Left. 44.05% "Absolutely riveting read, right from that first landing and the apparition that dismounts from having crossed the Channel."